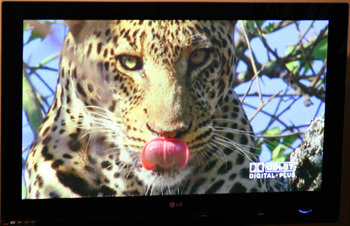 This is a second tier model in LG's 50" plasma 2008/2009 lineup. So the TV has some budget conscious constraints as our review below will point out. All 2008 LG plasma TVs claim a dynamic contrast ratio of 1,000,000:1 and this series plasma has a native contrast of 20,000:1. Some of the features are effective and some not so much. The Fluid Motion and Video Noise Reduction features do not seem to have much effect on performance while the Clear Voice technology and Gamma picture function do work very well. It also contains some of the other common enhancements found in all of LG's new plasma lineup such as Clear Voice technology which enhances and amplifies the human voice element in programming with lots of background noise or music. There are 3 AV modes for preset picture viewing – sports, games, and cinema and the housing for the plasma contains the new invisible 10W X 10W speaker design with SRS Tru Surround technology. Resolution is 1024 X 768 (720p). The depth of these newer models has been reduced to 3.4". There are 3 HDMI input options on this plasma television. 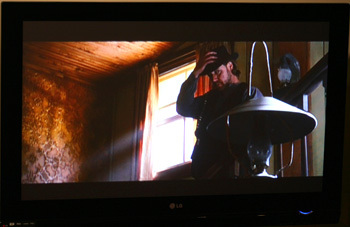 Up conversion from 480i and 480p: Viewing the recent 480i release of 3:10 to Yuma starring Russel Crow was a pleasere on this plasma as it displays very natural earth tones and good dark shadow detail. This is a "refined" 480i DVD so not as difficult to produce a good picture from as some older DVDs but the LG 50PG25 did a fine job of producing great images. At times and with some 480i sources we noted the 50PG25 budget oriented chip sets struggling to up convert without grain and background noise. This is typical for a budget plasma or LCD and one reason the higher end units demand a higher price tag. Flesh tones were natural though not the best we've seen. 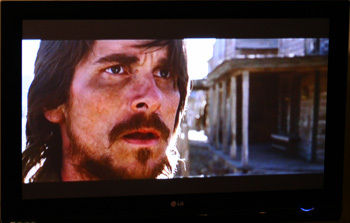 and excellent light transition in 3:10 to Yuma. 720p/1080i/1080p Picture Quality: The 50PG25 is a 1024 X 768 plasma TV and therefore shows best in 1080i resolution. 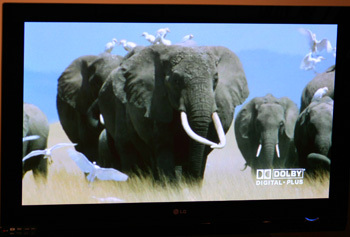 The HD picture during Safari scenes from our Blu Ray Dolby test disc had no problem displaying smooth fast motion scenes in vibrant colors. I have see better definition and color rendition and there is a subtle lack of pop to color information. However, this is a budget plasma TV and therefore is not expected to contain premium processing. I do like the fact that the plasma does not compromise color information by overcompensating in bright areas as many TVs these days make the mistake of doing. I would rather the picture be accurate and understated than have sections of oversaturated images. viewed in this HD shot from Safari. HQV Processor Testing: The LG 50PG25 performed very well during our Video Resolution Loss Testing showing no dithering in vertical or horizontal bars. There were just slight jaggies noted near the horizontal axis in the Jaggies test. Testing showed that 1080i is certainly the best resolution for this television as it is with most. Surprisingly there was some jerkiness (similar to motion lag) in our Film Resolution Loss Stadium seating test when the scene pans slowly side to side. This is unusual for a plasma TV. There was little to no moire' pattern noted in the seating. Black Level: The LG 50PG25 has average black levels but allow good dark shadow detail. Dark Shadow Detail: Black information did not oversaturate darker scenes yielding good shadow detail in clothing and night scenes. The Gamma setting is useful in this regard and can be adjusted depending on room light conditions. in Safari. Notice the wrinkles defined. Color Rendition/Color Accuracy: Color information was somewhat more subtle and muted in HD content than expected. With 480i signals I thought this plasma performed admirably enough with regard to color. It was pretty good especially in a darker room environment. Viewing Angle/Off Axis Viewing: As with most plasma TVs the viewing angle for the 42PG25 was exceptional – about 160 degrees. Exceptions: The Video Noise Reduction and Fluid Motion features seem to have little to no effect in testing. Motion Lag: Surprisingly there was some jerkiness in our side to side panning Film Resolution Loss Test (stadium). However, we did not notice or detect it during fast moving film content. Video Aspect Ratio Sizing: Aspect ratio processing and sizing was spot on non-distorted from a variety of input sources. Selection is auto, 16:9, 4:3, Zoom 1, 2. Zoom 1 and 2 are actually justified sizing options for a variety of widescreen signals as opposed to just zoom options. We found them useful and effective. Inputs: 3 HDMI inputs, 2 component, one 15 pin D sub (for computer) and a USB port round out a generous supply of input compatibility. Aesthetic Considerations: This is a very nice looking plasma TV with a relatively thin frame and a single layer glass design that gives a uniform appearance. Speakers are hidden and we measure the plasma at just over 3.4" which makes this an ideal wall mount TV. The subtly attractive ON/Off button is lit in blue in the bottom right section of the frame. A good looking accompanying swivel table stand completes a well done job on design. 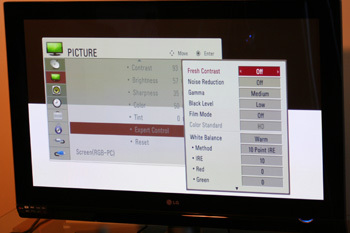 Remote Control/Menu Functionality: The LG 42PG25 menu functionality has the same options as much higher end LG LCD and plasma and for that reason is a good value. It's one of the easiest menu systems to navigate and use on the market. The non-backlit remote control is fairly complete with the exception of a lacking aspect ratio button on the interface. Otherwise, it too is easy to use. As mentioned above there is a 10 point multi adjustment for White Balance. Audio Output: The LG 50PG25 contains dual 10W speakers which are housed in the bottom section of the plasma with sound emanating from the bottom of the plasma. At first we thought the sound was pretty poor overall during film DVD content. However, turning on the SRS Tru Surround function enriched the sound somewhat. But the most important feature regarding sound is LG's Clear Voice Technology which allows voice frequency material to increase in volume over surround noise. It's an effective feature that works and the user will want to activate it through the easy to use menu. Features: I like the effect of the non-reflective structure of the plasma pixels. It does help with non-glare considerations. This plasma contains all of the features found in the PG20 series plasma. However, there is an additional USB 2.0 input port. As on all of the new LG plasma TVs lifespan to average half life has been increased to 100,000 hrs. The PG25 plasma series also begins design upgrades to a single layer front glass panel with no bezel creases for a crisper appeal. The number of HDMI inputs is also increased to 4 on this plasma (three in the back and one on the side.) Highlight features are Gamma setting adjustment, and Clear Voice technology. Televisions in the higher end range are getting so good that budget conscious models sometimes fail to dazzle even though they do a fine job as a journeyman. The LG 50PG25 has very nice aesthetics with the streamlined no bezel edge single layer glass design. The frame is thin and attractive and at just over 3.4" in depth this is good budget model for any room. At $1200 it is the best deal out there in a 50" plasma for the budget wary. There are a few noted drawbacks such as non stellar upconversion yielding some background noise and colors that dont blow you away. But heck, for a couple hundred less than Panasonic and Samsung equal level competitors take this unit rather than an inferior 3rd tier Vizio product. Review Equipment Used: Sony Blu Ray BDP-S1 High Definition DVD player, Sony DVP-S50 DVD player, Sencore Color Pro 5000, Sencore Auto Cal Pro, Sencore signal generator, Sencore VP403.